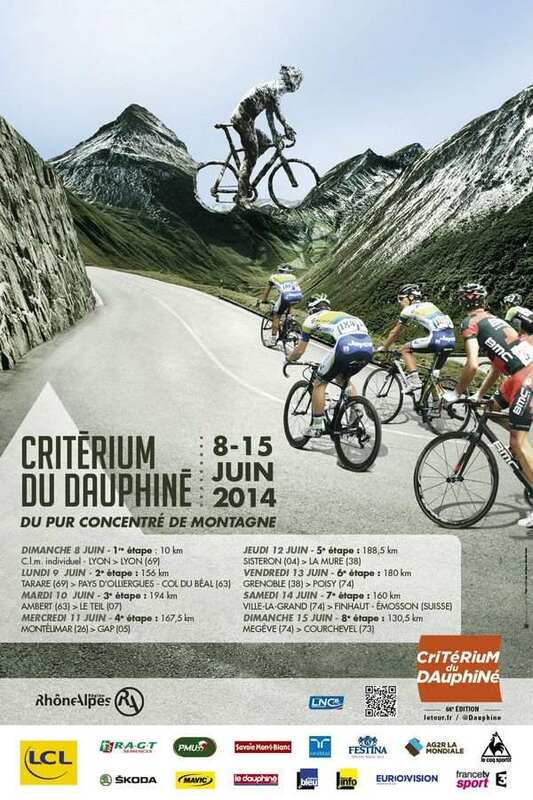 The Criterium du Dauphine takes place this year from June 8th – June 15th and is seen as one of the traditional warm ups for the Tour de France. Starting in 1947 the list of past winners includes many Le Tour legends including current champion Chris Froome and past winner Bradley Wiggins. Run over eight stages in the Dauphiné region in France the tour this year starts in Lyon and takes in nearly 1200km of racing ending in Courchevel. Last years winner Froome will be hoping for another one victory. So before we talk about the teams and potential contenders lets have a quick look at the route. Nice flat opening time trial with one minor incline along the way, should be an interesting battle for the TT specialists. Straight into the climbing with no messing about! 2 Cat 4’s, 2 Cat 3’s 1 sprint and the finish is rated HC up the 1390m Col du Beal. 2 Cat climbs but the last bit is flat and could ultimately end up a day for the sprinters. 1 Cat 4, 1 Cat 2 climb but a downhill finish which could mean a breakaway battle out at the end. 6 climbs today no HC rated but it should mix things up nicely. Climbs galore! 2 Cat 2’s, 1 Cat 1 and 2 HC! 3 more nasty climbs to end the tour with a mountain top finish. So who’s riding this year? Well who’s not? The list of starters is a who’s who of past and potential Tour de France winners. A safe bet would of course be on Chris Froome, he’s after another win here and a big one in the tour but with his team under performing a little bit someone else might just be with a shout. You can never discount, Contador, or Nibali who’ll be hot on his heals but some other riders are also in with a shout. Tejay van Garderen might find it difficult to keep up in the mountains sometimes but recent form shows he’s not to be written off and Simon Spilak (Katusha) is starting to make a name for himself in week long races and may fancy a go at this one. Keep your eye on the likes of Thomas Voeckler and Michael Kwiatkowski as they are always mixing it up in a breakaway, you can count of them to at least try for a stage. Whatever the outcome, the line up suggests it’s worth watching! Tagged Critérium du Dauphiné, racing. Bookmark the permalink.